This month, it’s ten years since ‘Sheila’ went out with her mate ‘Stella’. Jamie T’s Panic Prevention hit double digits at the end of January, which means a decade of twanging bass guitar riffs, half-lisped lyrics, and that long, tracking shot video by the Thames that illustrated the gobby Sheila’s grim fate. While Jamie T (nee Treays) isn’t what you’d call a godfather of this particular noughties’ indie-rap hybrid – that title rests with The Streets’ Mike Skinner alone, and we all know it – Panic Prevention introduced him as the genre’s slightly neurotic older brother. 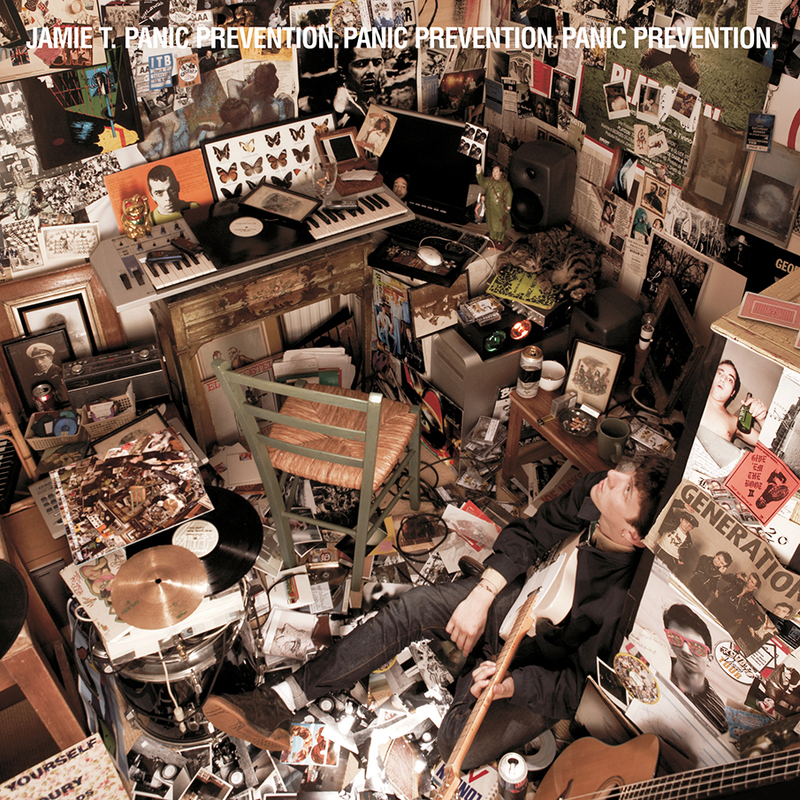 Panic Prevention’s lead single ‘Sheila’ brought Jamie T’s tangled consonants to the masses, as he narrated the tribulations of a gaggle of drunks and addicts. The single introduced many of the themes that would reappear throughout the record – the stories of inner-city youth, binge drinking, and falling in and out of love. Panic Prevention sees London through a fisheye lens, taking everyday details and warping them into something more significant. ‘Sheila’ also set the tone for the album’s cross-genre musical collage style, as Treays spliced spoken word samples and Casio keyboard beats into half-sung raps and bass guitar riffs. The mash-up style was repeated throughout the album; in the hopping rhythm of ‘Salvador’ and the excitable collage ‘Operation’, and on the shambling, scrappy ‘Pacemaker’. The latter is a prime example of what made Panic Prevention such a vital record to the generation of Brits coming of age in the late 2000s. ‘Pacemaker’ is all youthful exuberance and false masculine bravado, the lyrics scattered with references to drunkenness and house parties, and nights out at fallen London venue the 12 Bar Club. ‘Pacemaker’ also hints at another recurring theme across the album – music. Panic Prevention is stacked with songs about singing songs. On ‘Pacemaker’ Treays raps, ‘White socks, black shoes with the ballads in the car’, while third single ‘Calm Down Dearest’ features the line ‘kick it like we know the songs already’. ‘So Lonely Was the Ballad’, too, conjures up images of ‘girls singing on the bus’. Snapshots like these, paired with the skits and chatter between songs, root the album in reality. This sense of authenticity is one of Panic Preventions major strengths. While Treays’ middle class upbringing was touted in some early reviews of the record as being at odds with his MC style, his view of London from the southern end of the District Line felt like something natural. Musically the album teetered between genres, from indie to rap, ska and hip-hop. This too felt organic, the stripped back bass-guitar and vocal tracks like ‘Back in the Game’ and ‘Brand New Bass Guitar’ a natural counterpoint to the more layered ‘Ike and Tina’ and ‘Salvador’. After its release the vibrant, vital record was nominated for the 2007 Mercury Prize, but lost out to Klaxon’s new rave album Myths of the Near Future. No matter. In the decade since, Panic Prevention been passed along to the next generation of teenagers, who still swarm Jamie T shows to chant ‘Sheila goes out with her mate Stella…’. At ten, Panic Prevention proves itself to be a modern classic.